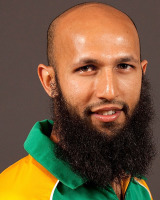 Hashim Amla: Long of beard and patience. End of day score. England 385. South Africa 403/2. Every now and again in Test cricket a team experiences not merely a bad day but total demoralization. Because the Test match may go on for five days, a side can not only grind the opposition down but can stamp on the ashes and scatter them to the four winds. Today was such a day for England, who toiled for six hours and only took one South African wicket. South Africa are now 17 runs ahead with the chance to gather the scattered ashes of England, reconstitute the body, and then destroy it all over again—sending a signal not only that they are going to win the series but attain the number-one spot in world cricket. South Africa’s batsmen were dominant: the crab-like captain Graeme Smith poked and prodded his way to 131, while the elegantly understated Hashim Amla (183 not out) and the indomitable warship Jacques Kallis (82 not out) piled on the agony. This match is heading in only one direction, and that is a crushing defeat for England. Unless . . . This entry was posted in Cricket, England, South Africa, Test Cricket and tagged Graeme Smith, Hashim Amla, Jacques Kallis. Bookmark the permalink.